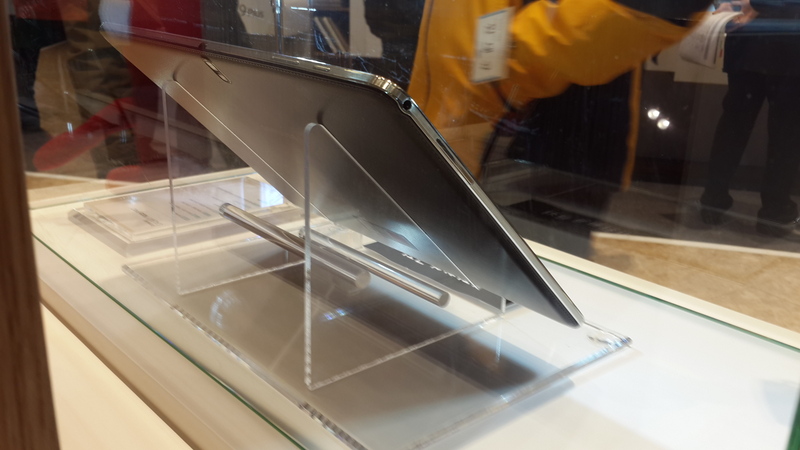 [Update: Photo of backside added] Samsung’s 12.2-inch tablet to be called Galaxy Note Pro? It looks like details on Samsung’s upcoming tablets are flying in thick and fast. A 12.2-inch Samsung tablet has been rumored quite often this year, and according to Moveplayer.net, this extra-large slate will be called the Galaxy Note Pro. Google’s translated text is a bit confusing, but apparently the Galaxy Note Pro will sport mostly the same specs as the Galaxy Note 10.1 2014 Edition – a 2,560×1,600 LCD display and 3GB of RAM – though it will run on Android 4.4 KitKat and sport a larger battery (9,500 mAh). An announcement is expected to be made at either CES or MWC next year, so this will likely be one of the four new tablets expected from Samsung in the first three months of 2014. Whether a 12.2-inch tablet will find enough buyers remains to be seen (the Pro tag suggests Samsung is focusing on those that want their tablets to be more than just entertainment devices, with the help of the S Pen and big screen), but considering there’s even a 13.3-inch tablet in the works at Samsung, whether people will buy these large tablets is probably what the company wants to find out, in its usual “flood the market with lots of form factors and devices, see what sticks” strategy that gave us devices like the Galaxy Note. Update: The Note Pro has been confirmed by our insider, and here’s a live picture of the back of the Note Pro, courtesy of cdpkorea.com. 12.2″ would make an excellent tablet for students and professional artists. Looks like a back of a regular Note 10.1 2014 Edition!